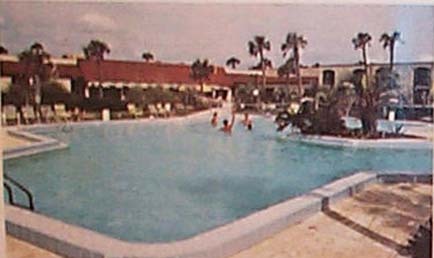 ITT Levitt, later ITT CDC Pledged a public 'Palm Coast Beach Club' with Features and a 150 ( became 132 Rooms) Room public Palm Coast Motel Beachside on acres and acres of Palm Coast Oceanside for all of us Palm Coasters. 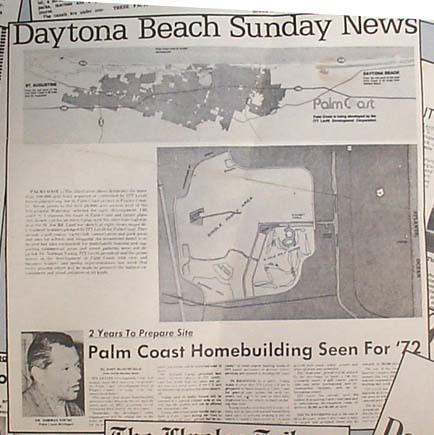 The First public 'Palm Coast Beach Club' with Features became the clubhouse for the Hammock Dunes Community of Palm Coast. 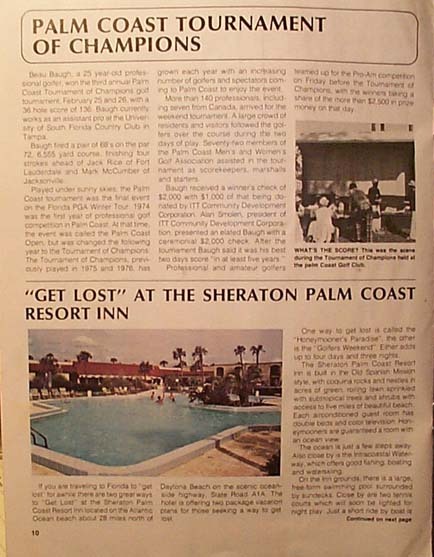 Later the Palm Coast Beachside 132 Room Motel became a public "Resort Complex' called the Sheraton Palm Coast Resort. 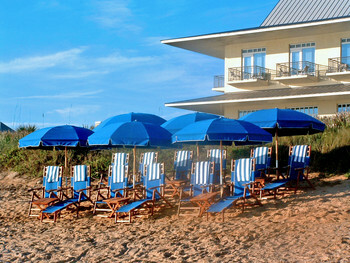 An upgraded NEW Palm Coast Beach Club, a.k.a. Sunsport Palm Coast BeachClub, a.k.a. The Lodge is off of 16th Road from A1A. It was overlooking 5 Miles of " Palm Coast Beaches "...People were flown in and stayed Beachside on the five miles of Palm Coast Beaches. 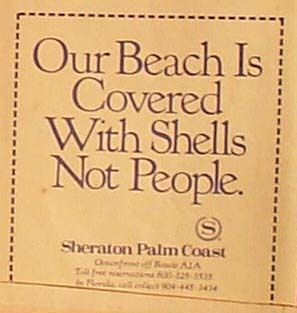 The Slogan...'...Our Palm Coast Beaches are covered with Shells, not people..'. made many a Sale. For more information about our Pledged Amenities see: http://palmcoasthistoricresources.tripod.com in the HEADER 'Our Beginnings'. Thank you. Initial Offering Pledges and Promised by ITT Levitt showing the location of them all. Here are some examples of the Developer Pledged Palm Coast Beach Club, and the 132 Room public Palm Coast Motel, later and a.k.a. 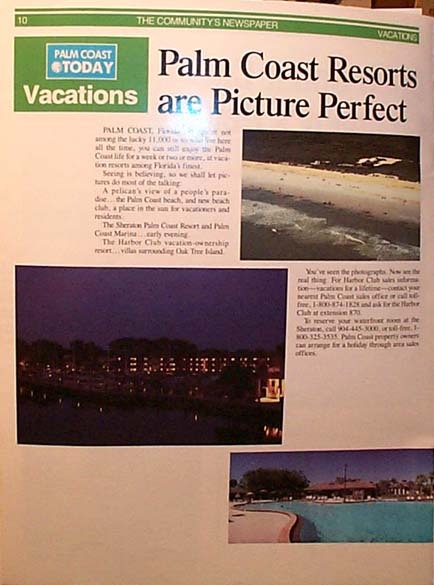 The Palm Coast Resort that we once had oceanside. They include a Golf Course, Yacht Club, conservation and park areas and sites for schools and shopping. 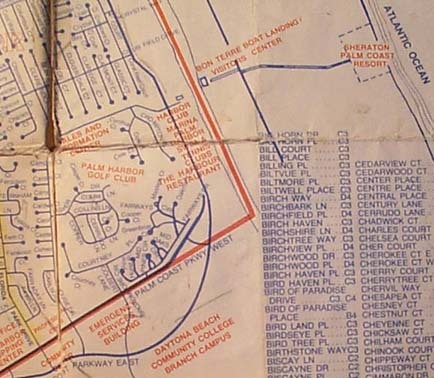 An Oceanfront Motel is indicated but sites earmarked for multifamily housing and supporting commercial areas and street patterns were not depicted . Br. Norman Young, ITT Levitt president and the prime mover in the development of Palm Coast told civic and business leaders and media representatives last week that every possible effort will be made to preserve the natural environment and avoid pollution of all kinds. Young emphasized that ITT Levitt efforts will be directed toward installment land sales to persons seeking a site on which to build a retirement or vacation home. 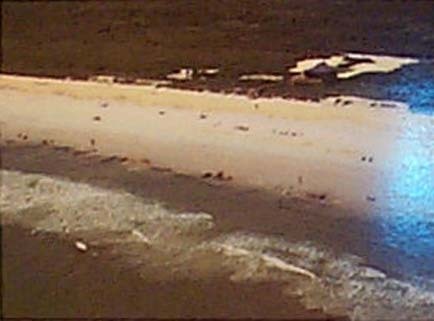 when Palm Coast is fully improved with roads, water sewers and other utilities and amenities. The "lead time' period will be utilized by the developer to build a 150 unit oceanside motel, a golf course, yacht club and other recreational and environmental facilities, and an information center. Please Note the location of the Beach Club, the 150 unit Beach Motel pledged by ITT Levitt. It is labelled on the extreme middle right of the above Presentation. Note the Golf Course Area; there are no Hi Rise/Hi Density Puds there within the center core of the Golf Course. Pls. Note Above: Statement how the Palm Harbor Golf Course 'Boat to Golf ' Dock was inextricably intertwined and interwoven in the Advertising and Sales Promotions. 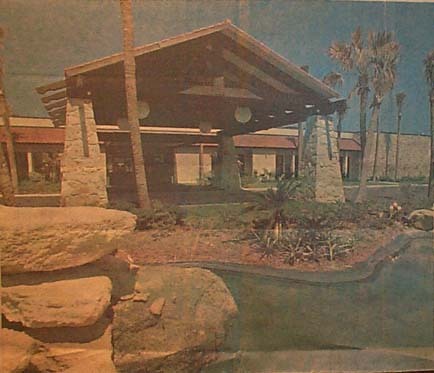 The Sheraton Beach Club / Motel we once had, now Demolished. The Front Entrance of the Palm Coast Motel we once had. 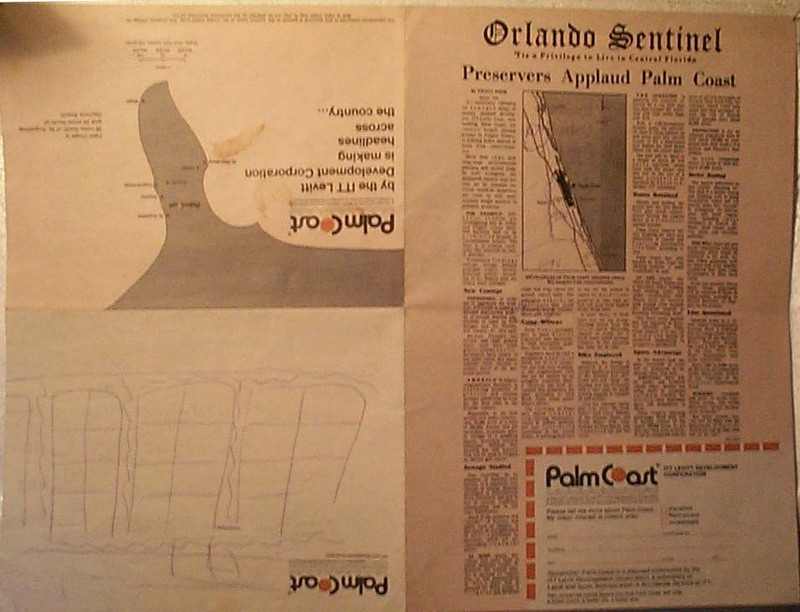 The PalmCoaster , Winter 1988, pp. 10-11. Our ITT Levitt Pledged Amenities overlooking 5 miles of 'Palm Coast Beaches'. 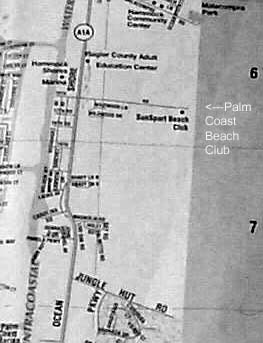 Above is a map showing our Pledged Amenity that we paid for: Our Palm Coast Beach Club with Oceanview Swimming Pool, Tennis Courts on 8 Acres of Palm Coast Community Lands directly on the Beach...OVERLOOKING FIVE miles of Palm Coasts' Beaches ! For a small annual Membership fee everyone in Palm Coast could enjoy our Palm Coast Beach Club a.k.a. 'The Sunsport Beach Club'. We will remain Stewards of all this Information hoping for a 'Certified Local Government' like so many other Florida Leadership Cities already are. We're hoping for a Museum like Flagler Beach already has.